A simple device that mounts to the underside of your TechBridge and provides a home for your power strip and electric cords. 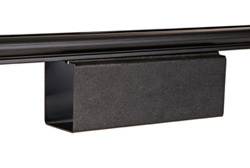 Formed ABS plastic Shelf holds standard power strip. Secures to the underside of the TechBridge using carriage bolts and wing nuts.